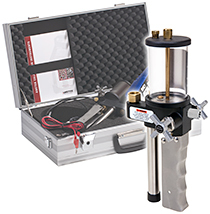 The T-600 Series is a lightweight and portable hydraulic hand pump, specifically designed for high pressure applications. A fine adjust allows precise control of pressure, while a vent valve provides quick and positive shut-off and pressure release. The pumps are compatible with petroleum-based oils or hydraulic fluids.